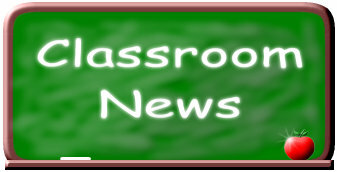 The following articles have been submitted by your classmates or found on the internet and compiled here on one page for your reading pleasure. I'm sure they will bring back memories for you. 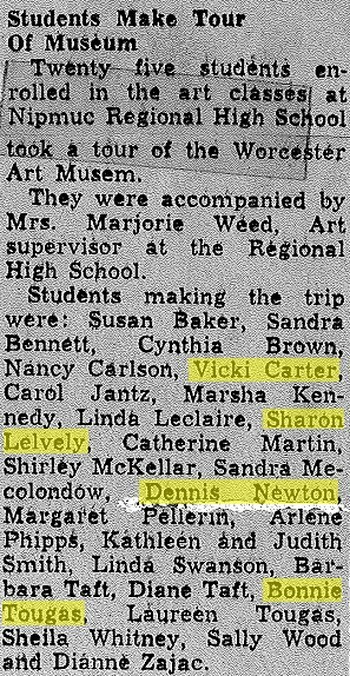 If you have an old newspaper clipping from our school days or even articles in the news from your life, please send it to me so I can upload it here for all to enjoy. Mrs. Grace L. (Callery) Lovely, 99, of Mendon MA, died Saturday evening (February 17, 2018) at Countryside Healthcare of Milford after a period of declining health. She was the wife of the late Leo T. Lovely, who died in 1975. Mrs. Lovely was born in Brockton MA, the daughter of the late John F. and the late Saydie I. (Tilton) Callery. 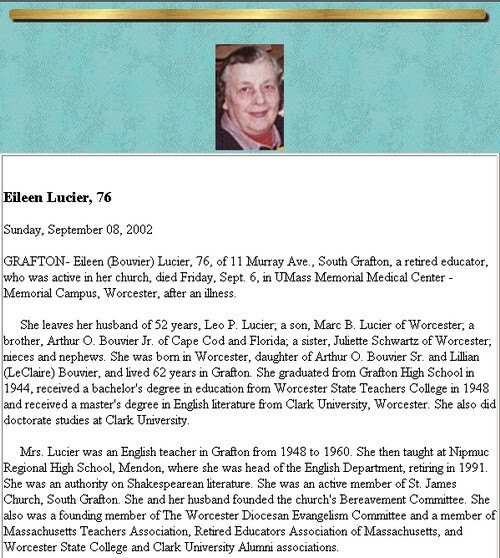 She attended Brockton public schools and Milford public schools. She had been employed for over thirty years at the former Norfolk County Trust Company, which later became Bank of America. She later worked as a bookkeeper at the Franklin News Store, retiring at the age of eighty-five. Mrs. Lovely had volunteered as a Boy Scout den mother for Milford’s Troop #8 and also as a Girl Scout Brownie leader in Mendon. She was a member of the former St. Michael’s Church in Mendon and presently a member of St. Gabriel the Archangel Parish in Upton and had been an active member of the Women’s Club for both parishes. Mrs. Lovely enjoyed and loved her family and her “home”, which she and her late husband Leo built over seventy years ago. She had a passion for reading and retained a wealth of knowledge. You could always “Google Gracie” for information. Mrs. Lovely also loved to crochet especially doilies, snowflakes, afghans and “Gracie’s Hangers”. She was an avid NE Patriots fan! You did not call her when a game was on TV. She was also the recipient of the “Golden Cane Award” in February 2017 as the oldest living resident of the town of Mendon. Mrs. Lovely was a great wife, mother, grandmother and friend. She will be missed and remembered by all her family and friends. She is survived by 1 Daughter: Sharon, wife of Frank E. Feccia Jr. of Hopedale MA; 1 Daughter-in-law: Ida (Floru) Lovely of Blackstone MA; 4 Grandchildren: Leo A. Lovely of Cincinnati OH, John E. Lovely of Milford MA, Jennifer Quinn of Sutton MA and Keith Lovely of Blackstone MA; 9 Great Grandchildren; 1 Great Great Grandchild; also many nieces & nephews. Mrs. Lovely was the mother of the late Leo John Lovely. 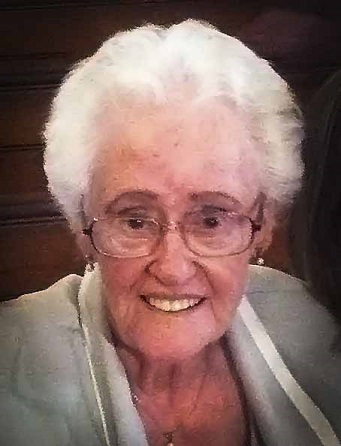 She was also the sister of the late Frances Callery, the late Madelen Morris, the late John Callery, the late M. Lorraine Mitchell, the late Bernard Callery and the late Robert Callery. Her funeral will be held Wednesday (February 21st) at 9am from the Edwards Memorial Funeral Home, 44 Congress Street, Milford MA followed by a Mass of Christian Burial at 10am in St. Gabriel the Archangel Parish, 151 Mendon Street, Upton MA. Burial will follow in St. Mary’s Cemetery in Milford MA. Visiting hours will be Tuesday (February 20th) from 5pm to 7pm. In lieu of flowers, memorial donations may be made to The Michael J. 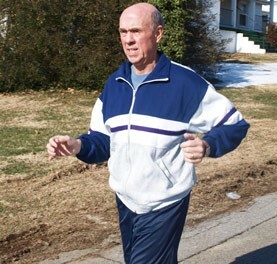 Fox Foundation for Parkinson’s Research, P O Box #5014, Hagerstown MD 21741-5014. 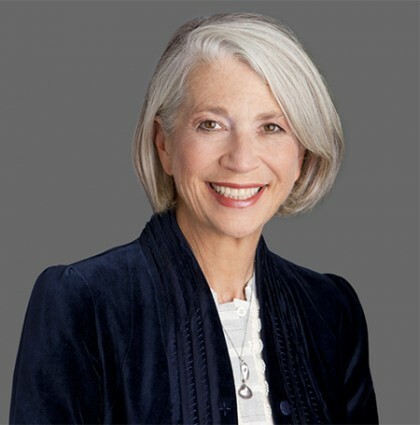 Elaine Tuttle Hansen, a scholar and educator who has served as executive director of the Johns Hopkins Center for Talented Youth for the past six and half years, plans to step down at the end of August, the university announced today. Under Hansen's leadership, CTY has enhanced its renowned summer programs, expanded its research efforts and resources, further developed its online and international presence, and helped place thousands of pre-collegiate students on a track toward achieving their full potential. "A place like CTY is so special. The more I reflect on it, the more I value the essential role it has to play in nurturing advanced young learners and modeling best practices for transformative teaching everywhere and anywhere," Hansen said. "What I'll take away is how incredible it is to work with people who are so committed and who believe so passionately in the mission and contribute so much to the cause of education. "CTY has had an immeasurable impact on generations of young people," she added. "I will always remember and be in awe of the stories of personal transformation former CTYers have shared with me." CTY, founded in 1979 by a Johns Hopkins psychology professor, has long been recognized as a world leader in identifying and developing the talents of academically advanced K-12 students. "WHAT I'LL TAKE AWAY IS HOW INCREDIBLE IT IS TO WORK WITH PEOPLE WHO ARE SO COMMITTED AND WHO BELIEVE SO PASSIONATELY IN THE MISSION AND CONTRIBUTE SO MUCH TO THE CAUSE OF EDUCATION." Hansen said she was especially proud of CTY's growing commitment to access and inclusion for its programs. She has been instrumental in developing the center's Baltimore Emerging Scholars Program, a pilot after-school initiative that partners with local elementary and middle schools to improve learning opportunities for gifted students from under-resourced neighborhoods. Founded in 2014, the program currently serves 120 second-, third-, and fourth-graders, helping them hone their critical-thinking skills through courses in astronomy, architecture, and engineering. "Everyone at CTY is doing work every day that develops a love of learning for learning's sake," Hansen said. "I've been fortunate to support and build on the work that this unique center does to bridge the divide between K-12 academics and higher education." 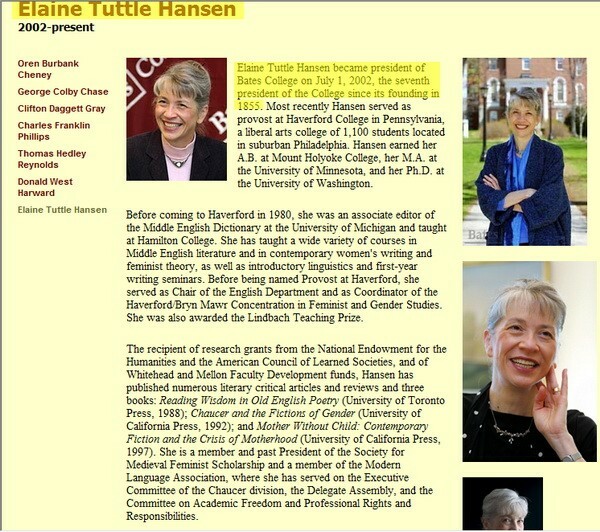 Hansen joined CTY in August 2011 after nine years as the president of Bates College in Maine. Finding the position was a "lucky accident," she said—she had planned to leave Bates for a sabbatical when the opportunity came along. Hansen intended to be at CTY for five years, "but I overstayed my welcome by two," she said. She plans to take that long-delayed sabbatical after she leaves CTY and also hopes return to her scholarly work in Middle English and feminist literature. "I have a few projects that have been on the back burner for way too long," she said. In a message to the JHU community today, Johns Hopkins Provost Sunil Kumar commended Hansen for her "steadfast commitment to increasing educational opportunities for young people, for her outstanding leadership, and for her many valuable contributions to Johns Hopkins." 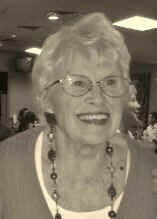 Barbara C. (Packard) Phillips, 92, passed away Tuesday, January 30, 2018 at Countryside Healthcare of Milford, surrounded by her family. She was born in Marlboro, New Hampshire, July 31st 1925 the youngest child of Eleazer and Dora Alice (Derby) Packard. She was married in Woonsocket, RI January 13th 1946 to George Munroe Phillips who predeceased her in 1960. She is survived by her four sons, Eugene N. Phillips and his wife Linda of Hopedale, Kenneth P. Phillips and his wife Suzanne of Norfolk, Edward W. Phillips and his wife Mary Jean of Upton and Donald G. Phillips and his wife Eloise of La Habra Heights, CA; nine grandchildren, Amy Franks and her husband Norman of Hopedale, Joanna Maldarelli and her husband Kevin of Milford, Susan Hassett of Seminole, FL, Kenneth P. Phillips, Jr. of Norfolk, George K. Phillips and his wife Courtney of Milford, Chad Phillips and his wife Stacy of Las Vegas, Corey Phillips and his wife Katherine of Worcester, Mitchell Phillips of La Habra Heights, CA and Greg Phillips of La Habra Heights, CA and ten great-grandchildren. Her brothers, Merwyn D., Clare H., Lloyd A. and sister Wilhelmina M. predeceased her. Barbara had been a receptionist at the Former Curtis Lumber Co. in Milford for 17 years before retiring in 1987. She previously had worked at Danny’s Variety, Lowell’s Dairy and the Milford Daily News. Barbara was a member of the Joseph Emmerson Evening Alliance, the Mendon Unitarian Church and was a Daughter of the American Revolution. Visiting hours will be held Thurs. February 1, 2018 from 5-7 PM in the BUMA-SARGENT FUNERAL HOME, 42 Congress St., Milford. Funeral services will be held Fri. February 2, 2018 at 11 AM in the Mendon Unitarian Church, 13 Maple St., Mendon. Burial will follow in Swan Dale Cemetery, Hartford Ave., East, Mendon. 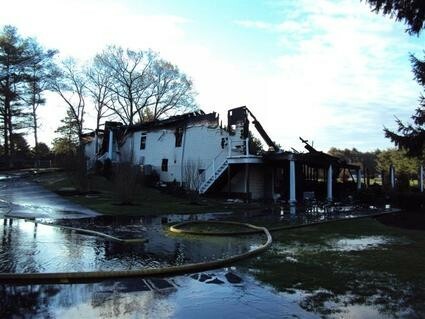 Memorial donations may be made to the Mendon Unitarian Church, 13 Maple Street, P.O. 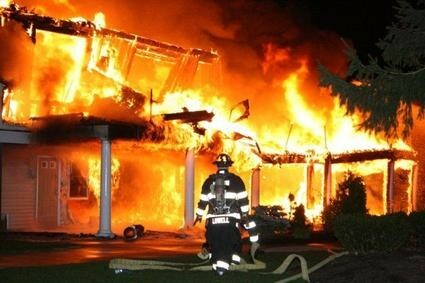 Box 392, Mendon, MA 01756. To send flowers or a remembrance gift to the family of Barbara Phillips, please visit our Tribute Store. WEBSTER - R. Lucille Gilbert 80 died Sunday Jan 21, 2018 at St.Vincent Hospital after a brief illness. Lucille was born in Webster. She is the daughter of the late Wilfred O Gilbert and Rose D (Labossiere) and lived here all her life. She is survived by Nieces, Nephews and great Nieces and Nephews.She was preceded in death by brothers George Gilbert and Sylvio A. "Chippy" Gilbert and sisters Lorraine M Puls and Doris Warhurst .She graduated from Bartlett High School in 1955. Received a Bachelors Degree in Business Education from Salem State in 1959. Received a Master of Arts Degree in Business Education from San Jose State College in 1972. 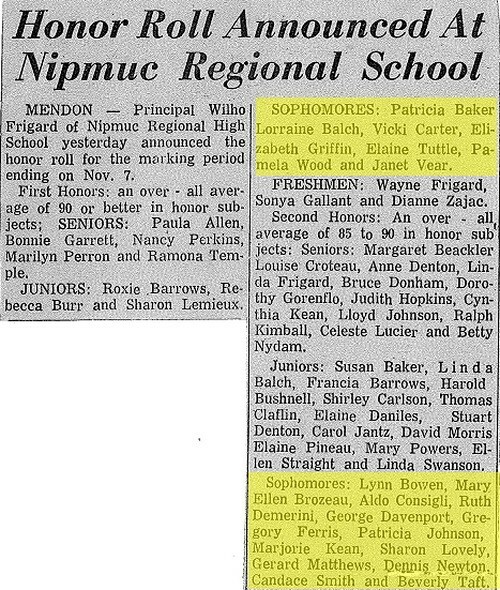 Lucille taught Business Education at Mendon High School in 1959 then moved to Nipmuc Regional High School and taught from 1960 to 1994. She was the former chairperson of the Business Education Department. Lucille was a devoted Catholic and a Eucharistic minister at her parish Sacred Heart of Jesus Church and an adorer at the Emmaus Chapel. She loved golfing and bowling with her sister Lorraine. She was a member at Dudley Hill Golf Club, Silver Sneakers, Power House Gym Member of the Massachusetts Retired Teacher's Association and the NEA Retired Teacher's Association and enjoyed bowling at Mohegan Lanes. WESTBOROUGH - Donald Lee Thatcher, 86, a longtime music teacher in the Milford Public Schools and respected musician and soloist, passed away on Wednesday, September 20, 2017 after a long illness. Don is survived by his five children, Michael Thatcher and wife Heather, Careywood, ID, Suzanne Barsamian and husband Gregory, Boylston MA, Sally Johnson, Sandra Kerr, and J Patrick Thatcher, of Westborough, MA; ten grandchildren; and four great grandchildren. He was preceded in death by his wife of 53 years, Joyce (Quimby) Thatcher, and his son, Stephen Thatcher. Don was born in Boston, on November 9, 1930, to the late Bernard Lee Thatcher and Mary Margaret Ryle. A loving brother to his sisters Bernice, Eleanor, Margaret and Mary, he learned at an early age to command attention with his resonant baritone voice! Don served as a Navy corpsman in the Korean War. Upon returning home, he earned his bachelor's and master's degrees from Boston University. He began his teaching career in Dexter, ME where he met his beloved wife, Joyce. 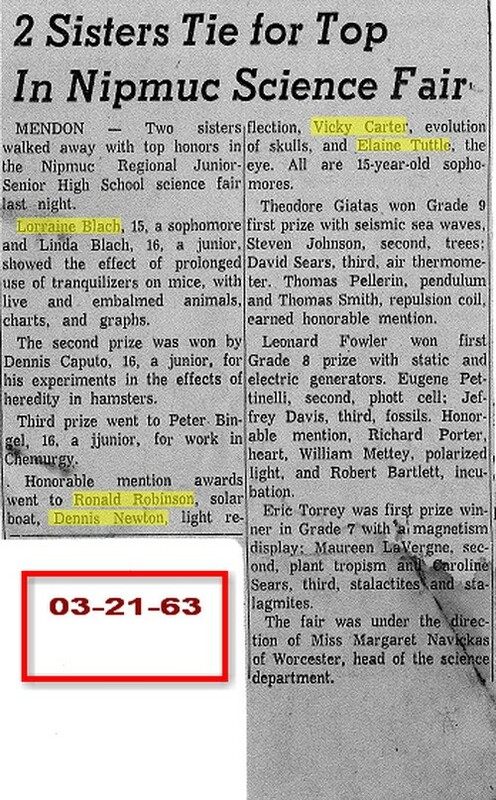 In 1960, they returned to Massachusetts with their budding family, where he continued teaching at Nipmuc RHS in Upton and later, Milford. The story of Don's 30 year love affair with Milford Public Schools is the one never written, however, his inspiring and loyal passion went far beyond the classroom. 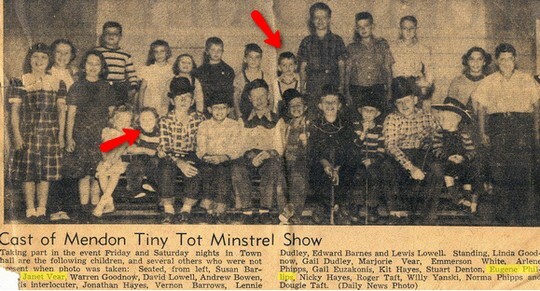 "Mr. T" was the quintessential "music man" to students young and old. He could be seen on football fields and in concert halls, directing the marching band, concert band, orchestra and various choral groups. His passion for musical theater led him to direct countless musicals and even perform in many. The role of "Don Quixote" in the "Man of La Mancha" became a favorite. Don's altruistic behavior spread into the community as well, directing music at St. Lukes Parish in Westborough and Milford Community Chorus for 35 years. 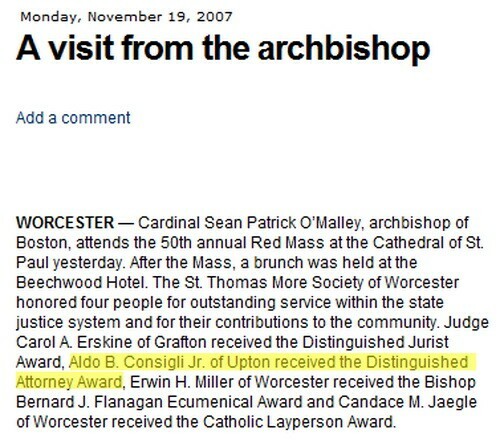 Don was former governor of the MA Society of the Order of the Founders & Patriots of America, member of the Sons of the American Revolution, Mayflower Society and an avid genealogist and history buff. When not teaching, he enjoyed reading, Sudoku, crossword, golfing, hiking, and cultivating his bountiful gardens. Family summers were fondly spent at the beloved cottage in Hancock Pt ME. Battling late stage Alzheimer's, Don conducted his own brand of music therapy, singing for residents and staff of his care facilities. His legacy includes a lifetime of relationships, accomplishments, truths and values, and it lives on in the lives he touched. His family is grateful for his many caregivers, especially Sue and Jim Malone, the VA and VNA Care Hospice. Calling hours are from 5 to 8 PM on Friday, October 13, 2017 at the David A. Pickering Westborough Funeral Home, 62 W. Main St., Westborough MA 01581. A funeral Mass will be held at 10 AM, October 14 at St. Luke the Evangelist Church, 70 W. Main St Westborough, MA. Burial to follow at St. Luke's Cemetery. In lieu of flowers, contributions can be made to "The Don Thatcher Music Scholarship Fund." Please make checks payable to: GMCC/Community Use. Mail to: Linnea Silvia, GMCC, 100 Lake St Bellingham, MA, 02019. 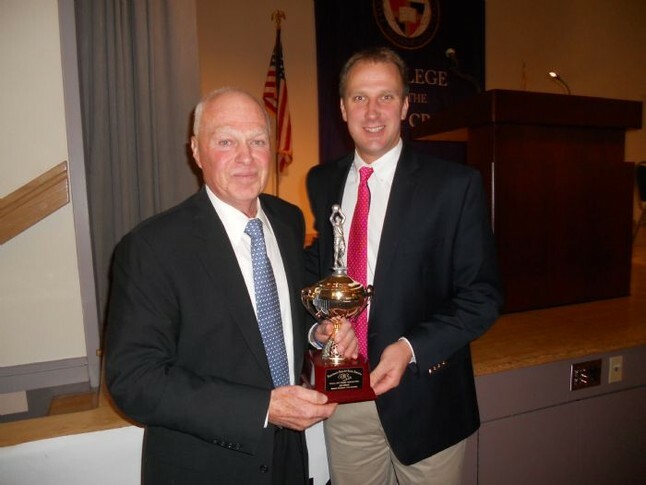 Despite retiring last year, Nipmuc High basketball coach Jim Grant added another honor to his resume on November 24, 2013 as he was inducted into the Massachusetts Basketball Coaches Hall of Fame. 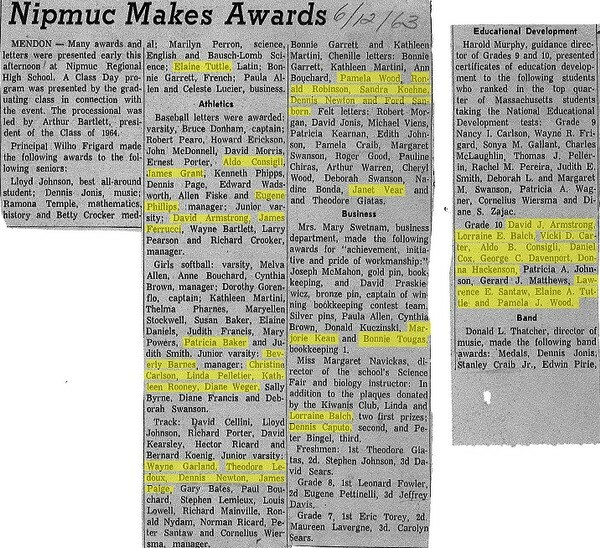 Grant won more than 500 games as the head coach at Nipmuc in a career that spanned nearly four decades. His teams captured the Clark Tournament title in 1993 and 1997, and his 1997 squad went on to win the Central Mass Sectional championship. In his induction speech, Grant was quick to share the credit with those who shared in the journey with him. 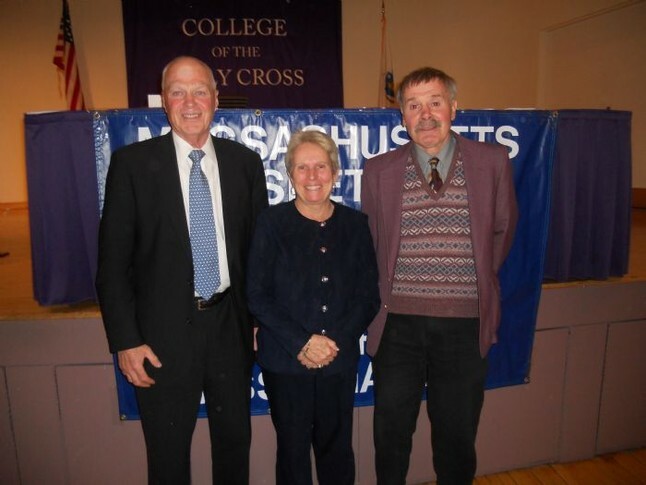 Grant was inducted as part of a three-member Class of 2013 that also included Jane Heil of Peabody and Tom Hill of Bromfield. He reflected on many of his favorite teams, from his first squad in 1975 to some of his stronger teams of the early 1980s to the 2012-2013 team which he said may have worked harder than he has coached. His son Michael was part of his 1993 Clark title team and his younger son Kevin was a senior point guard on the district team in 1997. In any year, Grant feels great coaches are made by great players. He returned to Nipmuc in 1975 after spending a year coaching at Nashoba. Former NRHS Athletic Director Al Byrne had coached Grant in both baseball and basketball and brought his pupil back and served as a mentor during his early years coaching. “If not for him paving the way for me to come back and take over what he had started, I never would have had the success I did at Nipmuc,” said Grant. Over the years, in addition to success at the varsity level, Grant has also been instrumental in developing the youth basketball programs in town. And, after more than 40 years, Grant is still coaching, helping out with his granddaughter’s fourth-grade travel basketball team. 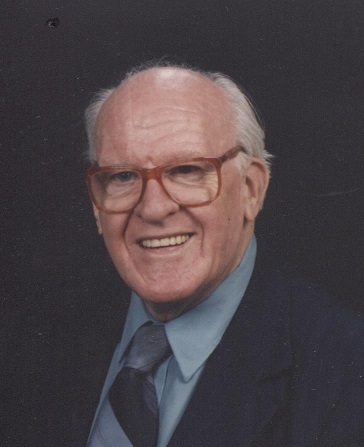 Upton – Homer Coolidge Sanborn, 89, of Upton died Tuesday, June 18, 2013 at the home of his daughter in Northbridge. He was the husband of Helen M. (Mann) Sanborn. Mr. Sanborn was born Oct. 4, 1923 in Thetford, VT the son of the late Harley and V. Pearl (Scribner) Sanborn. He was a graduate of Thetford Academy and soon after graduation he moved to Sterling, MA to work at an orchard farm. In Sterling, he met his future bride who was a resident of Sterling at the time. Homer and Helen Mann were married in the garden of the family farm in Thetford, VT. on Aug. 18, 1946 and were blessed with five sons and three daughters. Homer worked at the former Draper Corporation in Hopedale for several years. He was later employed as a steam pipefitter at the Wyman-Gordon plant in Worcester. He was a licensed plumber and since many of his customers were elderly, he charged them very little. Homer served as Deacon of the United Parish in Upton. He and Helen were both PTA presidents in Upton schools and each served as Master of the Upton Grange. They were avid dancers at various square dance clubs throughout the region. They hosted 31 exchange students from many countries. In turn, they were invited to visit the home countries of their exchange students – an experience they treasured greatly. He was a U.S. Marine Corps. veteran of WWII. In addition to his wife Helen, Homer is survived by 4 sons; Ford R. and his wife Linda M. Sanborn of Sutton, David N. and his wife Amy M. Sanborn of Upton, Dale P. Sanborn of Goodwater, AL, and Glenn W. Sanborn of Northbridge; 3 daughters Karen L. Wiersma of Northbridge, Valerie G. and her husband Michael Hopkins of Battle Creek, MI, and Holly F. Dion and her husband Skip of Auburn; a sister Maribelle Heno of Franklin; 11 grandchildren, 7 great-grandchildren; and many nieces, nephews and cousins. He was predeceased by a son Donald R. Sanborn, Sr.; 4 brothers, and 3 sisters. Funeral services, with military honors, will be held Mon. June 24, 2013 at 11AM in the United Parish of Upton, Central Square, Upton. Burial will follow in Lakeview Cemetery, Upton. Visiting hours will be Sun. June 23, 2013 from 4 - 7 PM in the BUMA-SARGEANT FUNERAL HOME, 42 Congress St., Milford. Memorial donations may be made to American Diabetes Assoc., 10 Speen St., 2nd Floor, Framingham, MA 01701. BALTIMORE May 20, 2012 — Elaine Tuttle Hansen, executive director of the Johns Hopkins Center for Talented Youth, challenged the 500 members of the Morehouse College Class of 2012 to not just charge ahead but to take time to reflect, to not only plan, but to plan to be surprised as they embarked on the next chapter of their lives. 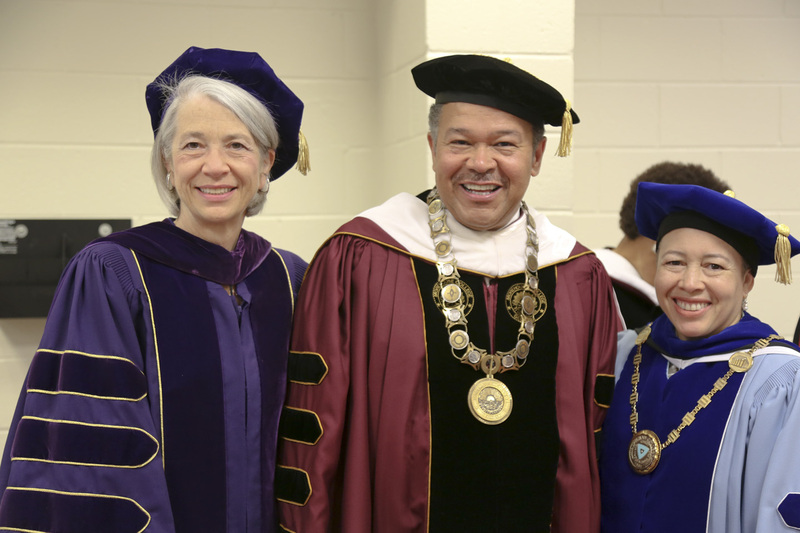 Hansen was awarded an honorary doctorate of humane letters at Morehouse College’s 128th commencement on May 20, 2012 at the school’s Atlanta campus. She was lauded by Morehouse President Robert M. Franklin for her tireless support of academically gifted students and for devoting her career to the education of bright young minds and the pursuit of academic excellence. Prior to her arrival at CTY in 2011, Hansen spent 30-plus years as a college professor and provost. For the last nine years she served as president of Bates College in Lewiston, Maine. Anne Katherine (Corcoran) Davenport passed away peacefully on Tuesday, April 17 at the age of 93 surrounded by her children. A long-time resident of Mendon and Hopedale, Anne was born in Providence, Rhode Island on January 22, 1919 to Michael Francis (“Frank”) and Mary Ellen (“Molly”) Corcoran. She graduated from the University of Massachusetts at Amherst in 1940. She and George Godfrey Davenport, Jr. were married on September 4, 1942 in the chapel at St. Patrick’s Cathedral in New York, NY. 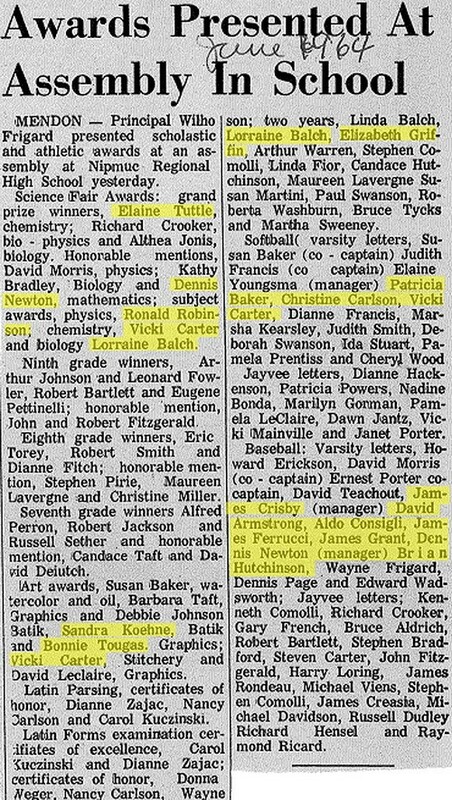 She taught in local schools from 1957 until her retirement in 1981. When teaching home economics at Nipmuc Regional High School, she expanded the curriculum to include life skills like budgeting and childcare—occasionally using a granddaughter as a model. She volunteered with the Milford Regional Medical Center from 1981 until 2007, working in the gift shop and knitting caps for the newborns. She was active in the Upton Women’s Club, the Quilting Club, a life member of NEA and a member of the teacher’s honorary society Delta Kappa Gamma. A longtime communicant of Sacred Heart Church, Hopedale, she provided baptismal garments which she sewed herself. She was a founding member of the Mustard Seed Ministry, providing and serving food and meals for the less fortunate. She is survived by her children Judith A. and her husband Leo D’Arcangelo of Milford, George G. and his wife Lynn Davenport of Lyman, ME, and Barbara D. and her husband Bill Arnold of Randolph, NH; 5 grandchildren Claudine Pannichelli (Jay), James D’Arcangelo (Amy), Heather Higgins (Kelly), Rachel Davenport, and Alexandria Dery Snider (David); 6 great-grandchildren, and many nieces and nephews. 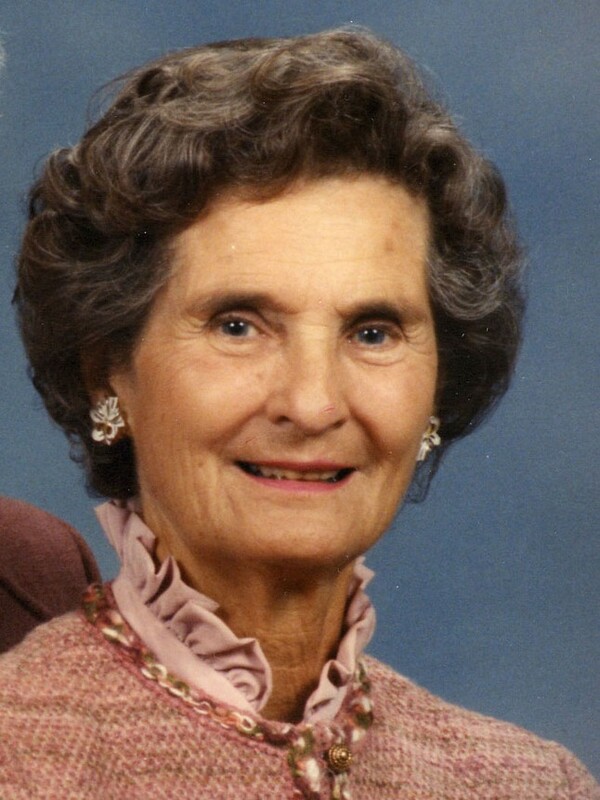 Anne was predeceased by her husband, George Godfrey Davenport, Jr.; her brothers Fred & Francis Corcoran, and her sister, M. Dorothy Driscoll, who passed away on Sunday, April 15 of this year. Funeral services will be held Monday April 23, 2012 at 9 AM from the Buma-Sargeant Funeral Home, 42 Congress St., Milford, MA 01757 followed by a Mass of Christian Burial at 10 AM in St. Mary’s Church, 19 Winter St., Milford. Interment next to her husband will follow in Locust Hill Cemetery, Mendon. Visiting hours will be Sunday April 22, 2012 from 3 – 7 PM in the funeral home. Memorial donations may be made to the Daily Bread Food Pantry, 21 Exchange St., Milford, MA 01757 or to the Ladies Auxiliary of the Milford Regional Medical Center, 14 Prospect St., Milford, MA 01757. Lillian A. (Cole) Ferris, 89, of Upton, died Tuesday evening, April 3, 2012, in Beaumont Nursing Center in Westborough surrounded by her family. She was the widow of Charles Herbert Ferris, who died in 2003 after 62 years of marriage. Mrs. Ferris was born in New Bedford, a daughter of the late Wilfred and Sarah (Horridge) Cole. 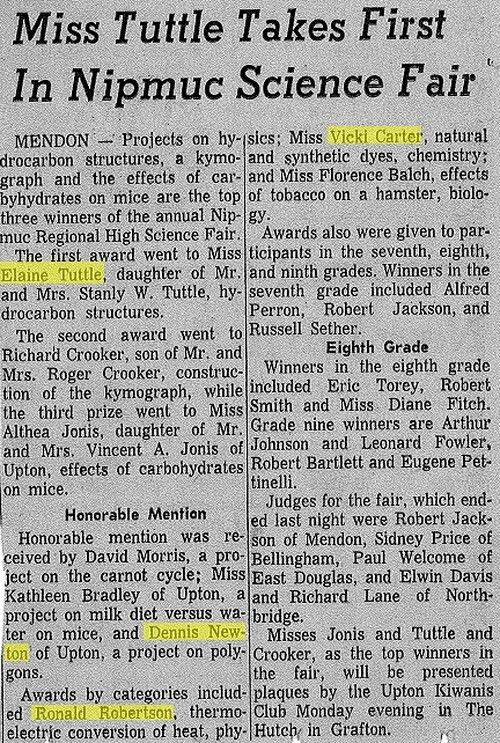 She lived in Rockdale and then in Fall River before coming to Upton in 1956. She worked at Blackstone Valley Tech High School in Upton for 22 years, retiring in 1991 as cafeteria manager. 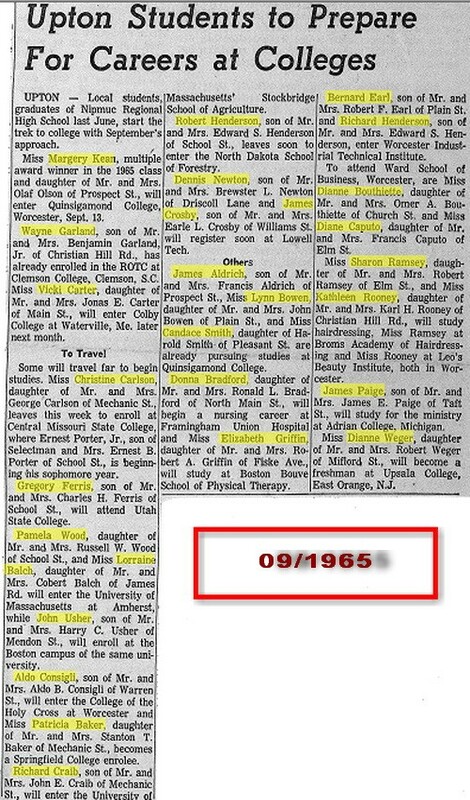 She leaves four sons, Charles H. "Bud" Ferris, Jr. and his wife Betsy of Harwich, Gregory M. Ferris and his wife Betty of Orlando, FL, Glenn L. "Larry" Ferris and his companion Linda Legg of Uxbridge, and Jay C. Ferris and his wife Karen of Upton; one daughter, Jill D. Beckwith and her husband Art of Webster; 16 grandchildren and 23 great-grandchildren. Her sister, Trudi Waring of TX, died last July. The family is grateful to the staff at Beaumont Nursing Center for the excellent care Lillian received there. At her request, there are no calling hours. Private services will be held on Friday in the Williams-Pedersen Funeral Home, 45 Main Street, Upton. Burial will follow in Lakeview Cemetery. If desired, memorial donations may be made to the VNA of Greater Milford, 25 Birch St., Milford 01757, or to MSPCA, 350 So. Huntington Ave., Boston 02130. Just wanted to forward an e-mail and picture of our National College Blue Ridge mountain marathon held on Sat. April 24th. We had about 900 participants for the marathon, which treks up 2 mountains on the 26-mile course. 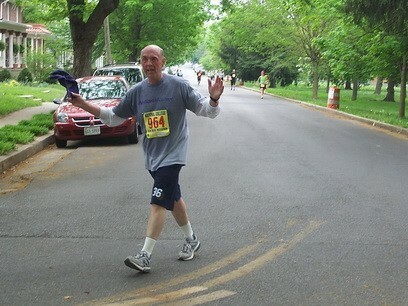 I did the ½ marathon, and completed the 13-mile course (only 1 mountain) in 2 hrs, 42 minutes, averaging 12 min. per mile. I power walked this course, since I’m not a regular runner. I managed to win 1st place in my Age bracket, trying to make a good showing for the class of ’65! You will see a picture (on Home Page) of me receiving my race award from my boss, the president of National College at the barbecue after The race. WESTBOROUGH - Joyce Crawford Quimby Thatcher, 80, passed away at home in the loving arms of her family on May 1, 2010. Joyce is survived by her loving husband of 51 years, Donald L Thatcher; five children, Michael J Thatcher, Rathdrum, ID, Suzanne L Barsamian, Boylston, MA, Sally A Johnson, Denver, CO, Sandra L Kerr, Sutton, MA and J Patrick Thatcher, Westborough, MA; ten grand children; and one great grandchild. Joyce was predeceased by her first born son Stephen Michael Thatcher. Joyce was born in Garland, ME on July 24th, 1924, to the late Norman & Louis Quimby. 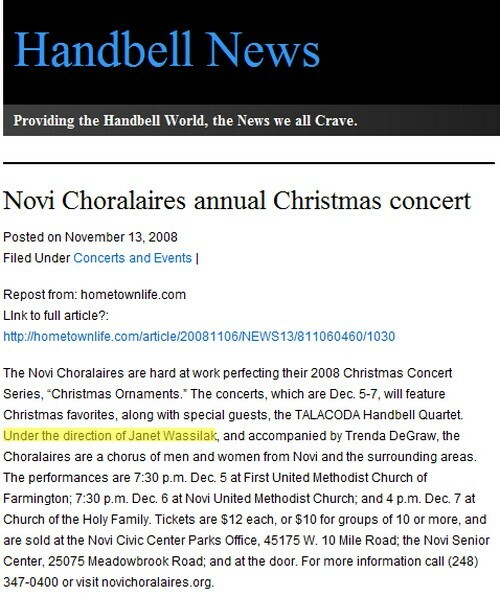 She attended Augusta, ME Schools & graduated from Dexter, ME High School. 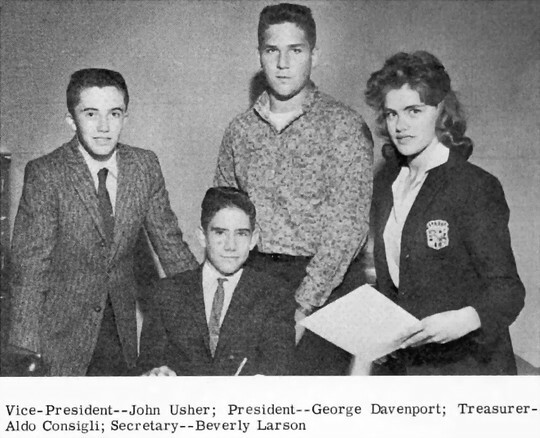 She attended Fisher Secretarial School in Boston, MA. Joyce retired from the Westborough School system in 1993 after 25 years of service. She started her career at Westborough High School and is fondly remembered as the "ICE CREAM LADY". She was promoted to management at the Hastings School where she retired. In the eyes of all her children's friends, she was like a second "MOM". She was happiest when cooking and attending to a boisterous, laughing, singing household of friends and family. Joyce sang with Westborough & Milford Community Choruses, St. Lukes & Holy Angels Church Choirs; played trombone in the Dexter, ME Fayscott Band and played a rollicking piano for the enjoyment of many. Relatives and friends are invited to attend calling hours from 5 to 8 P.M. on THURSDAY, May 6th at the Rand-Harper-Pickering Westborough Funeral Home, 62 West Main St., Westborough. Her funeral Mass will be celebrated on SATURDAY, May 8, at 10:00 A.M. in St. Luke the Evangelist Church, 70 West Main St., Westborough. Everett G. Lapierre, 66, of Uxbridge and formerly of Upton, died late Monday, April 5, 2010, in his home after an illness. 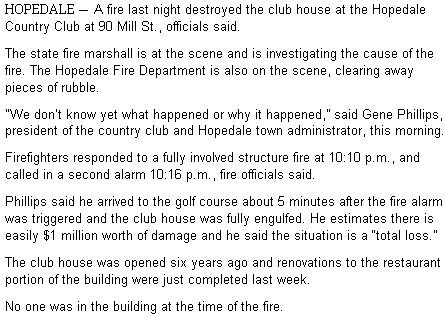 He was the husband of Cynthia L. (Simpson) Lapierre, and a retired maintenance supervisor who worked most recently at Draper Place in Hopedale. Mr. Lapierre was born in Upton, a son of the late Joseph and Corena (Paille) Lapierre. He had lived in Upton until moving to Uxbridge in 1986 and was a communicant of Holy Angels Parish. 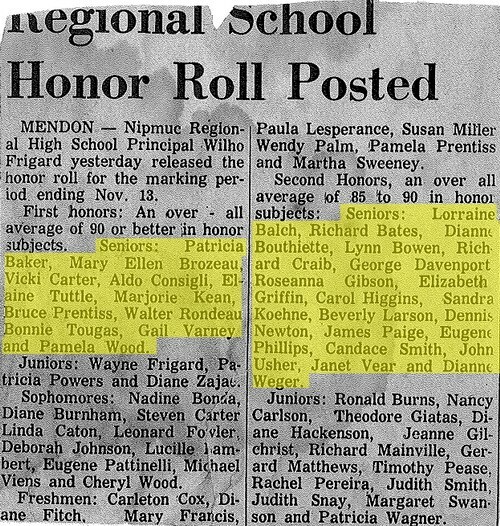 In addition to his wife of 24 years, he leaves one brother, Gerald Lapierre of Upton; two sisters, Linda LaBastie and Rose Marie Horton, both of Mendon; and many nieces and nephews. 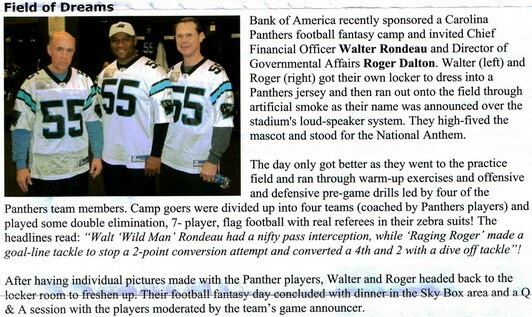 He was also the brother of the late Francis, Roger, and Joseph Lapierre and Florence Pope. Following cremation, a memorial Mass will be celebrated Wednesday, April 14, at 10 a.m., in Holy Angels Church, Milford Street, Upton. Burial will follow in Lakeview Cemetery in Upton. There are no calling hours. If desired, memorial donations may be made to the Friends of MetroWest MS Clinic, 115 Franklin St., Framingham, MA 01702. Arrangements by Williams-Pedersen Funeral Home of Upton, (www.uptonfunerals.com). 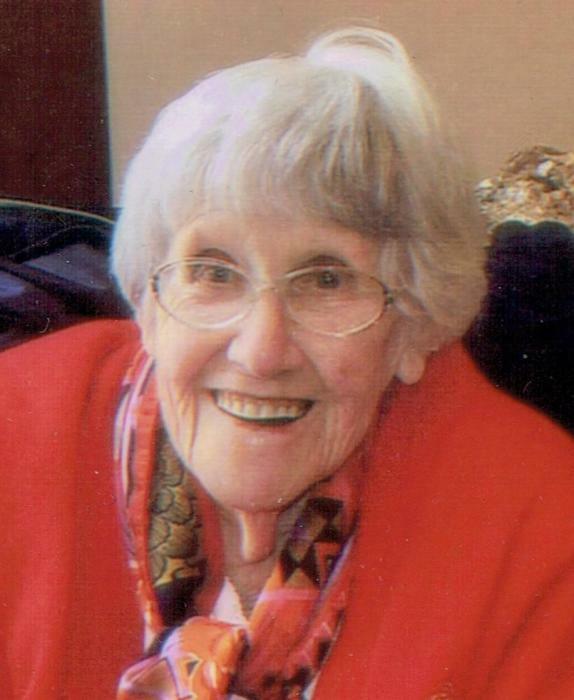 Eleanor Crockett Hutchinson of Falmouth, MA died on Tuesday, February 23, 2010 at JML Care Center in Falmouth after a lengthy illness. She was 91 years old. Born in Milford, MA, Mrs. Hutchinson graduated from Hopedale High School and the University of Maine, Orono. She spent her Junior year abroad studying French at the Sorbonne, in Paris from which she received a degree with High Honors. She later earned her Masters Degree in French at Clark University. During WWII, Mrs. Hutchinson was an officer in the Waves of the United States Navy. She worked in Communications on Terminal Island in California. Before her marriage. Mrs. Hutchinson taught French at Wareham, MA High School .Later she taught French, Latin and Spanish for many years serving as Chairman of Romance Languages at Nipmuc Regional High School in Mendon, MA and Fall Mountain Regional High School in New Hampshire. 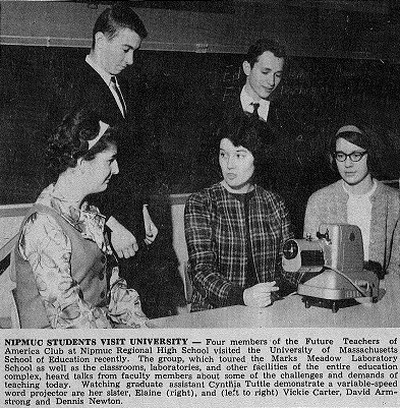 During her teaching career, Mrs. Hutchinson took her students to Quebec and Paris on many occasions. She was elected to the Delta Kappa Gamma Society, an honorary society for women teachers who have given distinctive service in the field of education. Mrs. Hutchinson was active in civic work in Hopedale, MA and Keene, NH. She held offices in the Milford Area visiting Nurse Association, the Hopedale Women's Club and the Hopedale Garden Club. Mrs. Hutchinson had been a summer resident of Falmouth since 1947 and moved here year round in 1978. In Falmouth, she had been active in the Racing Beach Association, the Garden Club, the Woods Hole Golf Club, the First Congregational Church, and the P.E.O., Sisterhood. She was the devoted wife of John W. Hutchinson who passed away in 2005. After a stroke left him blind, Mrs. Hutchinson devoted most of her time and energy caring for him for two decades. She is survived by her two sons, John, Jr. of North Falmouth, MA and Dr. Thomas Hutchinson of Falmouth and his wife Susan. She is also survived by five grandchildren - Robert and his wife Hilary, Carolyn Kingsley and her husband Clay, Julie, Laura and Christa Hutchinson. A funeral service will be held at 11:00 am on Friday, February 26 at the First Congregational Church, Main St., Falmouth. Burial will follow in Oak Grove Cemetery in Falmouth. In lieu of flowers donations may be sent to the Elizabeth R. Hutchinson Memorial Scholarship Fund at Trinity Pawling School, Pawling N.Y. or to the charity of the donor's choice. WALT IN THE NEWS AGAIN! 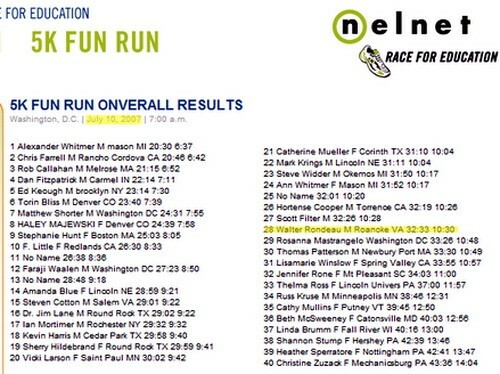 Saturday, April 24, 2010 in Roanoke. Walter Rondeau is the first person from the National College family to register for the upcoming National College Blue Ridge Marathon. Walter is the College’s chief financial officer, and although he has been very active his whole life, this will be his first marathon! “I have done about 100 5Ks, maybe 10 10Ks, no marathons to date!” He has signed up as a power walker for the half marathon.